To register, fill out the registration form and return to either Whistle Binkies location. Sponsorship opportunities are available. 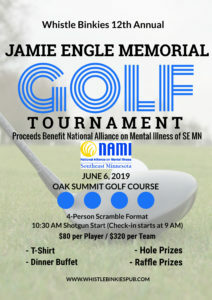 Golf tournament benefits NAMI SE MN. Copyright © 2019 Whistle Binkies. Built by EM EN Design.